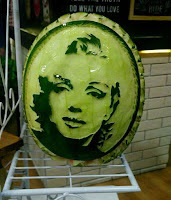 The art of chisel substanced by fruit which of course always healthy and fresh. This activity is popularly known as 'Fruit Carving.' Various forms can be formed according to the creator's imagination. The usefull of fruit as an art medium, until now has existed since 700 years ago. Precisely in Sakoikoi, Thailand. Fruit carving was first discovered in 1364. An accomplished artist named Nang Noppamart made a decorative boat light at a festival that is routinely performed during the month of December that falls. He carves fruits and vegetables into flowers until his engraving works look like a very beautiful Lili flower arrangement. Then the journey not only developed in Thailand, but also in China. The difference is Thailand has a characteristic carvings that resemble about plants and animals native to white elephant country. 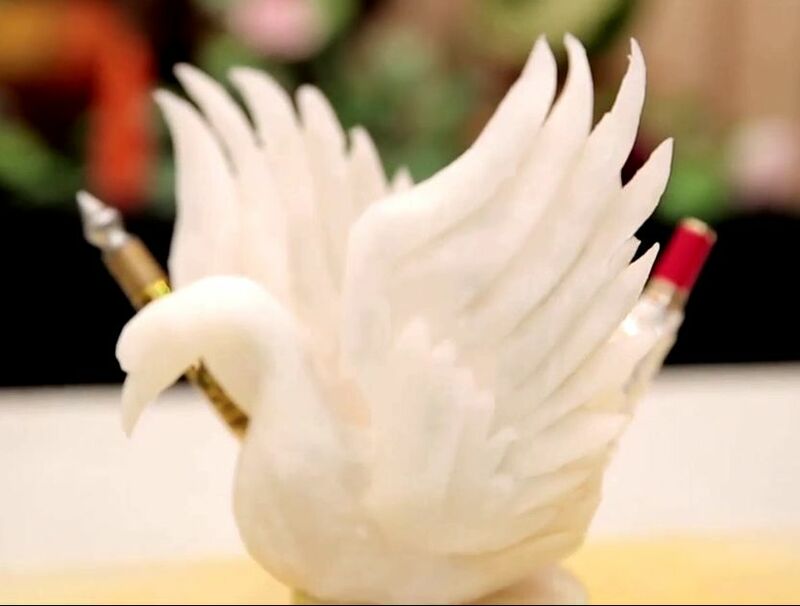 While in China, the fruit is carved in accordance with the philosophy or traditional events that closely related to culture, such as dragons, lotus flowers, and others. 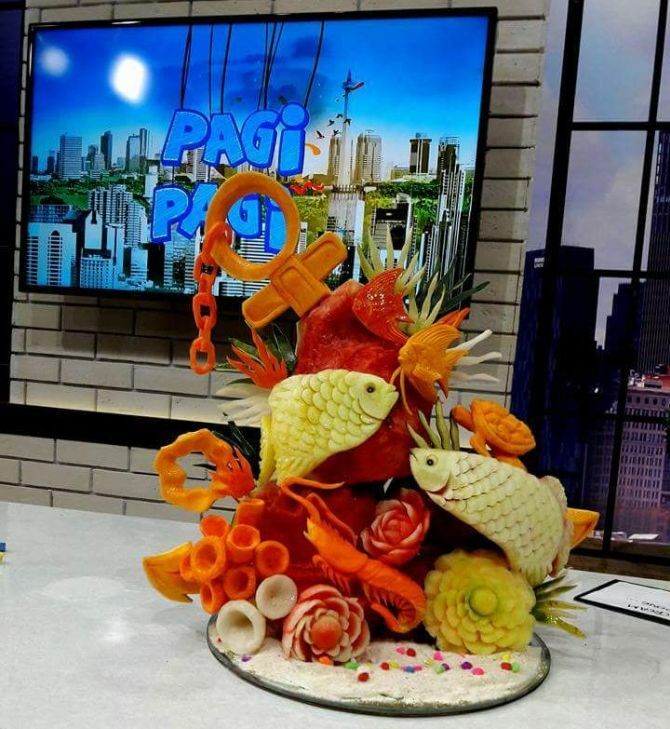 In a country like Japan, fruit carving is considered part of a typical food presentation and not just accessories. Watermelon, melon, honeybee, pineapple, and lots of fruit, as well as various types of vegetables. Almost everything can be carved individually or combined with a simple design that is complicated and fun. Talking about the existence of fruit sculpture art in Indonesia today, it turns out that many hotels and restaurants adopt fruit carving as a jewelry in the middle of the table or as decoration of food display at social events, companies, and wedding celebrations by locally. Only, it is mandatory selection of fresh fruit meat. This fruit engraving technique is only using a knife. But it exactly requires practice in order to form a perfect carving. The Beauty of the Fruit between the Chisel. Commonly used media that fruit, especially round-shaped and has a soft texture, fresh, and not too ripe to fit the plan of the engraving process. The tools used in the process of making fruit carving is quite simple. And it certainly makes these creations should have special expertise. Mr. Wetz Shinoda, an artist at Fruit Carving, said in an interview on You Tube: "For imagination, a carving man has to have imagination and imagination as to what he wants to make fruit carving, and if the ingredients we take are not so mature or half matured and part of my decision, the same as that.For the equipment, we can use an ordinary knife.But pointed sharp and also sharp.If the kinds of fruit usually: watermelon, melon, papaya, pear and strawberry.For regular vegetable pumpikn, turnips, carrots and bakco I think." 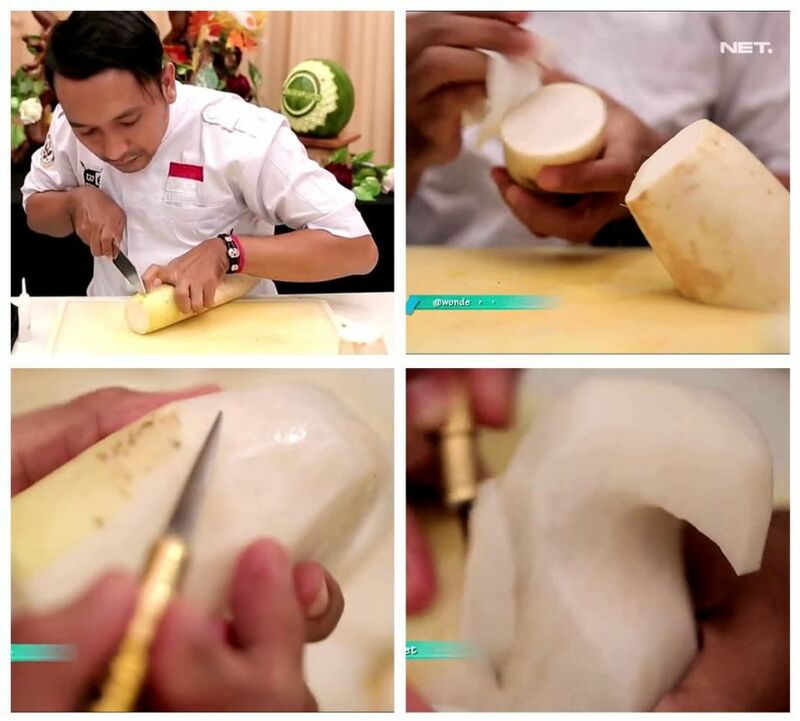 Incidentally he is also the founder of Indonesia Fruit Carving or IFC. A community he founded with Mr. Rabbani Art on June 25, 2015. Its members are currently 3,000 and average, those who already possess qualified skills in that field who can be registered. When firstly tried to get to know the art of sculpting fruit in 2010. "I studied fruit carving autodically, before I actually studied in wood media. Since working at a restaurant in Jakarta, I started enthusiastic chisel with media fruit and vegetable. Coincedental, my ex-chef on that time very supporting, "explained Mr. Wetz Shinoda to me on Facebook Chatting (29/05/2017). The training program requires strong patience and imagination, and also has a high artistic spirit to be able for learning a carve fruit into what is desired. So the intelligence and creativity of ideas in serving dishes to be expensive because it contains high artistic value. In the art of fruit carving! Carving and sculpture a medium fruit usually wearing a fairly simple tool. The most commonly used object is the carving knife. Carved knives also have many variation and respective functions. In addition to tools, the level of difficulty carving the fruit is quite high. Carvers must be careful, because once a wrong scratch or cut, it can destroy the initial design. Melon fruit, watermelon, and papaya is a type of fruit media for beginners. Experts, they usually use fruit sources such as carrots, strawberries, broccoli, telo, radishes, apples, pumpkins, mangoes, bananas, tomatoes, oranges, kiwis and pineapple to be characterized by birds, geese, dragons, etc. In decorating fruit carving, do not forget to add other products (flowers, vegetables, etc.) to produce a more enchanting circuit. Delicious Fruits and the Sweetest Future. For realizing all the above explanation, we do not need to bother anymore for looking a professional place of education. 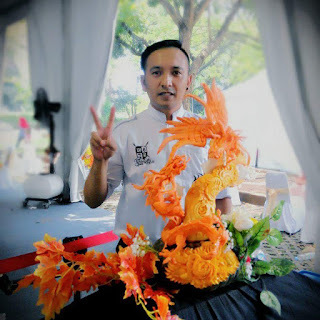 IFC (Indonesian Fruit Carving) has provided a very representative learning space for beginners like me and you to learn more about Fruit Carving. "Be firstly, it was stiff, because it was not used to it," statement by the new students on there. Likewise with IFC who until now has had a wealth of experience in terms of education and teaching, and usually receive training offers from various schools and government agencies. "Because the IFC does not limit background, profession, class, and race, so everyone can learn fruit carving," Mr. Shinoda explained. Friends who intend to be fresh fruit carving training students, you can ask directly to the IFC Office located on Jl. Tebet Barat dalam Raya No. 49. Education package specification has 4 categories, namely: Beginner, Intermediated, and Expert (advance), and Private Class. Well, IFC also provides categories of education classes to learn about Garnis, Tumpeng Rice Ornaments, Birthday Decorations, and Wedding Decorations. Contact number: Wetz Shinoda 0856-9235-6116, Ari Permatasari 0812-9783-6140, Billi Djoehan 0895-2690-3094. Address: Jl. Tebet Barat dalam Raya No. 49, Jakarta Selatan, 12810. Certainly in making these beautiful creations must have special expertise. 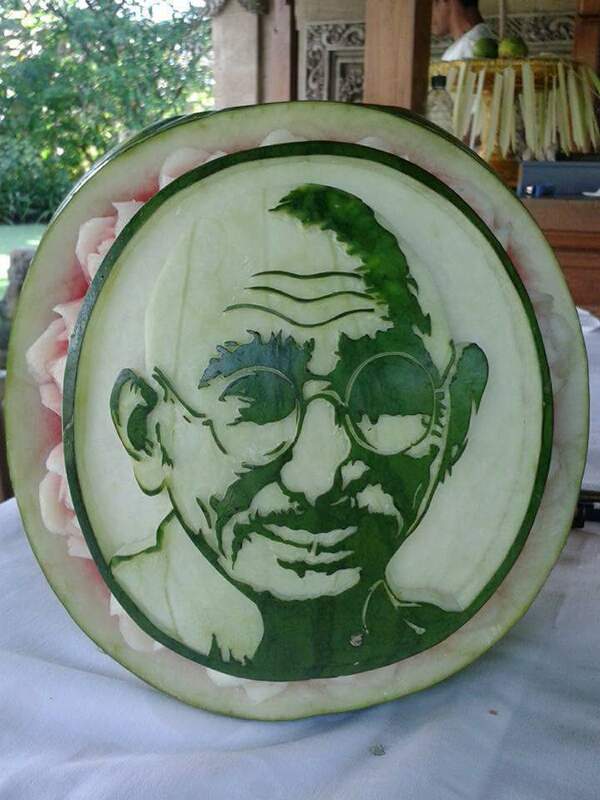 With a creative touch, fruit and vegetables can be used as decoration to beautify the dish or dining table. Indonesian Fruit Carving is the fruit carving community and the following images are the work of Mr. Wets Shinoda himself that you can watch on the You Tube video below. Just imagine ?? How fruits can change shape becomes like this. Very beautiful work. With all these kind! Thanks for your comments and All my hard work has paid off. So, please Follow me, then take all the articles by daily on My Feed Burner.